Rainy. Misty. Mysterious. These words describe our visit to Goldstream Park yesterday to see the salmon returning upriver to lay their eggs and then die. Droplets of rain falling on the thick leaf carpet beat a soft counterpoint to the rushing water swirling around rocks and splash of fish leaping upstream. Here, a leaf, barely submerged glows yellow on a very gray day. In autumn, death is so prevalent in nature, yet life begins, too, in the salmon eggs laid in sandy gravel and the decay of yellowed leaves. I could get very philosophical standing there in the woods, thinking about all of this. The seagulls pull me out of my musings. They are there to gorge themselves on the dying salmon, their plaintive screech filling the air as they watch which fish to feed on next. I know that Robert Frost wrote his poem about a winter's eve, but yesterday, the line that came to me was "The woods are lovely, dark and deep," for that they were. Full of quiet in spite of the cars rushing by on the highway. Full of the awe that is life and death. Deep with peace. I am not linking to Mosaic Monday, usually hosted by Mary at the Little Red House, because she lives in New Jersey, an area devastated by Hurricane Sandy. Mary is without power and trying to get a generator started to provide heat and power. Continue to pray for those affected by the storm. Lorrie your photos of the rain soaked leaves and streams are very unique and beautiful! The rain makes everything shimmer. I was once privileged to see the salmon returning to their spawning grounds near Valemount, BC. Quite an awesome sight and, as you said, full of the awe that is life and death. Always happy to have stopped by. Enjoyed listening in on your musings about autumn and the woods and life and death. Pondering is such a good thing. Pondering with the light of His Word is life-giving. This is one of my favourite places at this time of year, and again toward the end of the month when the eagles and buzzards arrive for their share of the feast. You've captured the mystery of that particular forest so very well. What a wonderful sight to see - a miracle! In that environment it's not difficult to ponder life's mysteries and marvel at the wonder of our great Creator. I'm missing Mary's Mosaic Monday too and praying for everyone affected by Hurricane Sandy. What a beautiful place, it must be fun to see the salmon. And I am sure the birds love eating all those fish. Lovely mosaic, have a wonderful week ahead! 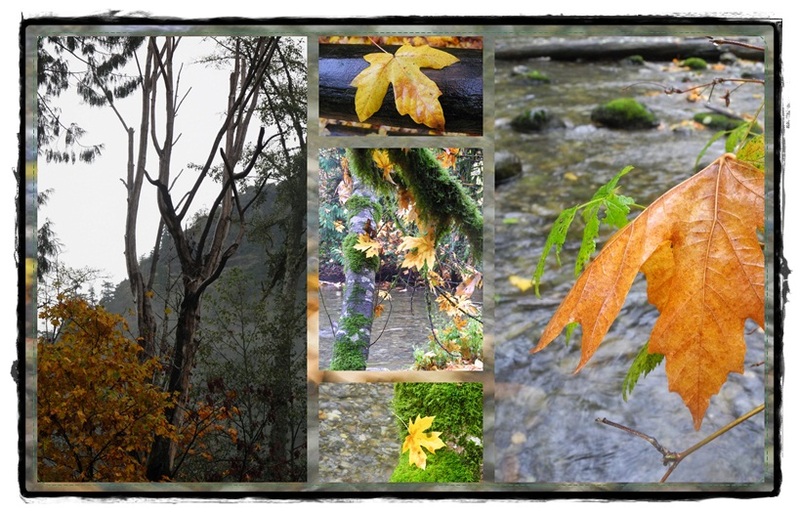 Goldstream is one of my favourite places in your corner of the world. The leaves are magnificent and those woods are truly dark and deep with the most beautiful autumn leaves. You've captures the essence of the park, Lorrie. Your pictures are lovely. I love that Frost poem. It is about death. And the choice, to choose life. The salmon are dying, but in effect, they are choosing life, and in Nature's economy, they are giving life, to their future generations, and to the seagulls. Such a ponderous subject, but I know you see the beauty in it. I know I do. Seems like such a grueling and gruesome end for the salmon. See what you've done! Made me feel sad for a fish. Frost...well you can't ever go wrong to ponder Frost. This is a beautiful post about the circle of life. It must have been quite special to see the salmon return to lay their eggs, and in such a beautiful spot. Thank you so much for your kind words on my blog - a lovely surprise! Even though I live far away from Sandy's embrace, my thoughts are with all those who have been affected by her brutal visit. Chills...you are a poet Lorrie. Thank you for sharing your thoughts and the images around you...they inspire and evoke so many things we all are feeling but haven't expressed.